Earlier this month I was in a number of Indian cities. My timelines for travel were tight, the projects were diverse and I was unwell. All of these factors, including the monsoonal weather, intense traffic, crowds, noise and pollution were a recipe for exhaustion and low tolerance for my environment. I wanted to share these reflections with you, because no matter how culturally intelligent you may be there will inevitably be moments where cultural differences and challenges will get you down; particularly in the context of frequent business travel. The difference between business travel and leisure travel is that you don't have as much control over your schedule and environments. You are there to do a job and you just have to get on with it as best you can. As I found myself becoming more and more irritated and frustrated with the street chaos, the scamming and transportation challenges, I had to keep reminding myself that my usual demeanor was not in place. I was aware of my mindset and how that was playing out in terms of my attitudes, behaviours and perceptions. It can be so easy to get caught up in the moment and react before you have even realised what it was that made you react as you did. Sometimes we can be surprised at our reactions to circumstance, how they make us feel and how out of character our responses can be. Visiting cultures that are vastly different from our own can very quickly lead to exhaustion and high levels of stress and anxiety. It is normal. Although the awareness of my mindset while in India couldn't change my circumstances, it did help me to navigate myself through certain moments and do things a bit differently to what I would ordinarily do. Some of these included using the hotel taxi service rather than a rickshaw, eating at the hotel rather than venturing out of the hotel and not over extending myself with social activities. Usually I tend to mix up my travel - I enjoy trying local street foods and restaurants, traveling around by local transport where I have opportunities to converse with locals and socialise with people outside of the office. I realised after a couple of days that this trip required me to take a less interesting, more humbled approach. I needed to preserve my health and energy. Don't over commit your time. Try to buffer in extra time to get to meetings, airports etc. Reassess your appointments - can you mange them differently? In some cultures we have less control than we do in others, different standards, rules, expectations and environments can all take a toll very quickly. I know that finding time to eat, rest and exercise properly when traveling can be at best difficult, but when we hit those times when our energy levels are low and the travel is getting us down, making some small adjustments can make an enormous difference to our attitudes, behaviours and outcomes. The Nine Dimensions of Culture Overview - Tom begins his new series examining The Nine Dimensions of Culture. This podcast offers an introductory overview. Why are the Danes the happiest people in the world despite their high taxes? Why do the Norwegians hate the Swedes? 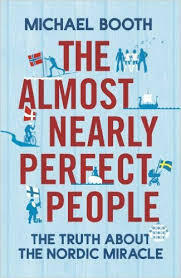 Having lived among the Scandinavians for over ten years, British Journalist, Danish expat, Michael Booth, is perplexed by the paradoxes, character traits and unquestioning enthusiasm for all things Nordic. Booth explains that until he moved to Denmark he thought of Scandinavians as just one big homogenous, bearded group of people. But after spending some time exploring the countries, he realised that they are radically different. This book outlines his travels across all five Nordic countries, where he delves deep into the Scandinavian psyche to find some answers. This is a reasonably short, entertaining, easy but insightful read. One observation that I did make, beware Booth often slips into stereotypes.